"There's only one thing in life worse than being almost forgotten and that's being completely forgotten" to misquote the great Irish writer and poet Oscar Wilde. 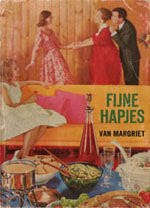 Such fate seems to have fallen upon Anton Heijn, who illustrated the cookery pocket book "Fijne Hapjes van Margriet" (Delicate Titbits by Margriet) in 1964. Margriet is the same women's magazine I wrote about in What's cooking? part 1. The illustrations in this book are rather good. 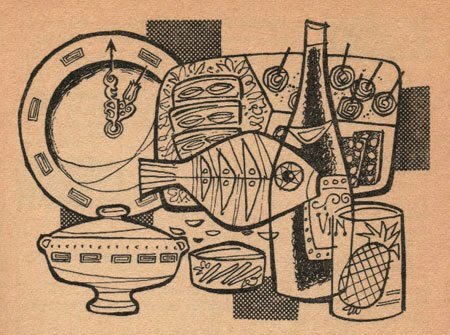 I quite like Anton Heijn's decorative style with that slight cubistic twist so typical of the mid twentieth century. Anton Heijn's illustrations are of such quality and graphic beauty that it's most unlikely that his work was only published in "Fijne Hapjes". Yet, searching the internet, I could find no reference to him other than this cookery book. And that, my dear friends, is not good. Not good at all! Although there's no doubt other work by Anton Heijn must have been published somewhere, it somehow has fallen into oblivion. Of course I will keep my eyes and ears open for any information about the elusive Mister Heijn and his work. However, should you happen to know anything, I will be glad to hear from you. I've got quite a few cookery books. Not because of I'm so fond of cooking. Au contraire, dear blogreaders! No, it's because of the illustrations in those books. I do have to say that I'm not a real cookery book collector. I don't go to auctions or search eBay hoping to acquire rare and undoubtedly very expensive editions. In fact, most of the books that are on my shelf were once the priced possession of my dear late mother. Other books I just happened to find in second hand stores, not paying more than a few pennies. Coincidentally all the books are Dutch and not so coincidentally all from the 1950s and '60s. Although not collectors items, these cookery books of mine are crammed with the most beautiful illustrations and I think they deserve to be brought back from oblivian. What better way than to use this weblog to do some good work? 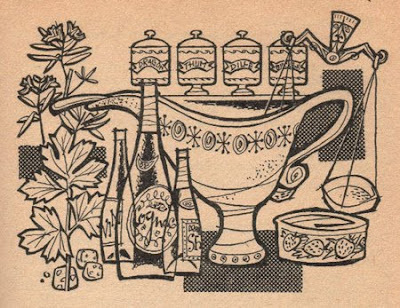 The first cookery book illustrations I would like to bring to your attention are by the hand of I. Spreekmeester. Although almost forgotten nowadays, Isidore Leonard - a.k.a. Ies - Spreekmeester was a well respected Dutch illustrator in his time. He made numerous illustrations during his lifetime (1914 - 2000), but I remember him best for the four Little Golden Books (Dutch edition) of "de Vier Kleurpotloden" ( the Four Colour Pencils) he made in the early 1970s. 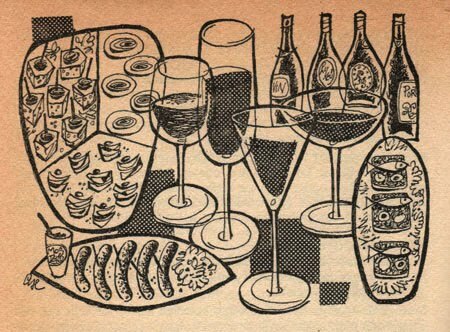 And of course the cookery book which is this blog's topic. 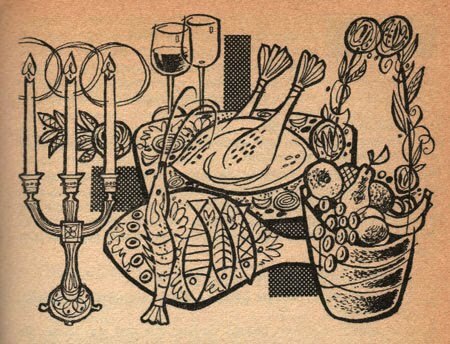 The Margriet cookery book illustrated by I. Spreekmeester must have been part of many Dutch households in the middle of the last century. Margriet is a women's magazine that has been around since 1938. For those not familiar with the Dutch language; Margriet is a girl's name as well as the flower known as daisy, which also happens to be an English first name. Now isn't that a coincidence!? The magazine also published a variety of cookery books. I don't know exactly when the first edition of the book with Spreekmeester's illustrations was published. I've got the thirteenth edition from 1962. Searching the internet, the earliest edition I could find is from 1955, but I'm not to sure about that being the real first publication. It strikes me that the illustrations by I. Spreekmeester are very witty and imaginative, sometimes a little weird and even a bit gruesome. That's remarkable considering that Margriet has always been, with all respect, a bit fuddy-duddy. 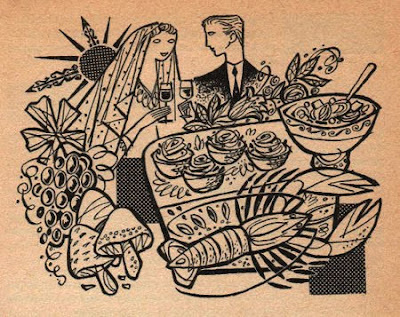 The illustrations didn't seem to bother the Dutch mid-century's housewife though. I guess she could appreciate a little bit of fun whilst looking up a recipe for daily supper.